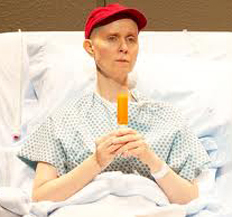 Cynthia Nixon, playing the lead in the Broadway revival of Margaret Edson’s play, Wit, does a heroic job putting her own mark against Kathleen Chalfant’s signature performance as the dying Vivian Bearing, the professor and scholar who meets the only fight she can’t win in her struggle with ovarian cancer. In fact, by the time her cancer is diagnosed, Prof. Bearing is as good as dead. At stage four, the cancer is already metastasizing and her treatment will mostly benefit science rather than herself. But in perhaps her one selfless choice, according to a script that finds its heroine mostly distasteful, Vivian signs up to undergo a rigorous eight-month treatment that doesn’t save her body, but in most ways saves her soul. Bearing is hardly a sympathetic character. By acquiescing to be the subject of research instead of a researcher herself, she learns that there’s more to life than finding new knowledge. The long hospital stay that ends her life is her last lesson in how to have the relationships that she regularly denied herself, devoting her time to the obscure and difficult sonnets of John Donne instead. Edson’s play, which won the 1999 Pulitzer Prize for Drama, wants to have it both ways. It indicts a medical establishment that sacrifices the humanity of its patients to its quest for their cure, but at same time indicts its patient, who’s devoted her own life to a similar kind of exacting and dehumanizing (at least in Edson’s version) research. Chalfant played this sacrificial character with a dignity and nuance that made her a truly tragic figure. Vivian learns too late in her life that she can relate to people instead of just teaching them, and that human feelings are more ennobled by living them than by engaging them on the page. Through direct address to the audience from her hospital bed, Vivian lays out the story of her life and her sudden illness, describing how her father rewarded her zeal for reading, and how her own intellectually significant female professor inspired her to ever better research and writing. Her tone is mordant and a bit self-deprecating, as though she’s embarrassed to think back on her trajectory from its sorry end. In the right hands, Vivian can be an engaging and self-aware narrator of her life’s excesses and can suggest that hers are just a different variation on those we all suffer. But as directed for laughs by Lynne Meadow, Nixon’s Vivian is a bit strident, her humor too forced and ironic, until the morphine finally calms her down toward the play’s end. She finds her humanity just as the medical establishment reaches the epitome of its objectification of her body. But Vivian is such an unlikable character until then that it’s hard to see her story as anything but a joke at the expense of a smart woman who’s happily chosen to devote her life to her work, however esoteric. Nixon is a smart performer, and emotionally enough in tune with the role that she does strike nice chords of sympathy with Prof. Bearing. And clearly the cancer narrative appeals to her. At a moment when so many women (including Nixon, who’s a survivor) are diagnosed with breast, ovarian, and other cancers, a play that addresses their situation with the frankness of Wit is very welcome on Broadway. It’s just too bad that Edson asks us to think only about how little agency women have in their own medical care. That, perhaps, marks her play’s age—witness the recent uproar over the lack of women testifying before Congress about their proposed legislation on women’s reproductive health, which might indicate how fed up women have become with just the kind of objectification and powerlessness that Edson’s play indicts. But a play that also allows audiences to laugh at the righteous pursuit of a life of the mind that Vivian Bearing’s career represents compromises its otherwise feminist intent. In this Broadway revival, Suzanne Bertishbrings terrific verve to her role as Vivian’s inspiring professor. She relishes the knowledge she imparts to her pupil, and then demonstrates utmost compassion when she finds Vivian again at the end of her life. When she crawls into Vivian’s hospital bed to read to her former star student, the moment is wrenching, not just because all she has at hand to read aloud is a children’s book she recently shared with her grandson, but because she loves and respects Vivian for who she is. The professor’s compassion at the end bears no moral judgment, which is so palpable in the rest of the play. She brings only a clear love and felt presence that finally ushers Vivian out of her life and into a kind of peace. This production ends as the original did, with Vivian’s resurrection of sorts after the death that finally, supposedly, frees her from physical and spiritual pain. Downstage right, Nixon unfolds from an embryonic ball of limbs and flesh into a triumphal, extended human “V,” naked and, I suppose, liberated. The moment is a bit too stark for my taste and too symbolic of the empty freedom that Vivian’s release into what Donne called the “pause” that is death brings. She holds her arms above her head in a peculiar, Pyrrhic victory. But her naked body seems also to signal how she sacrificed her physical desire for her intellectual ambitions. It’s the wrong kind of triumph to celebrate, and leaves the play rather hollow at the end. Nonetheless, it’s good to see Nixon claiming Broadway real estate to perform a serious play written by a woman. Edson never wrote another play after Wit, and still insists she has no intention of returning to the form. She continues to teach at an elementary school in Atlanta; Witwas the one dramatic story she wanted to tell. Given new oncology protocols, the play feels dated, though its critique of medicine’s essential inhumanity remains sadly relevant. Its portrait of a female professor as brittle and emotionally stunted still smarts. When do we get to see a story about a smart, talented woman intellectual who’s not punished by a fatal disease? These stories have been tiresome since Wit was first produced in New York in the ‘90s. I’m always glad when work by and starring talented women is visible in public forums, but how I wish we could hear stories that celebrate instead of implicitly denigrate their accomplishments, and that let them thrive instead of fade. Wit, on Broadway through March 17th.